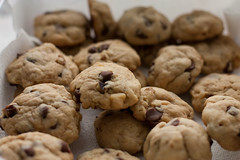 If you’re a chocolate chip cookie lover then today’s secret recipe is just for you. Famous Amos chocolate chip cookies are crunchy and packed with rich chocolate chips. Perfect for dunking in a glass of milk or all by themselves. Now you can bake these famous cookies fresh at home. To save time, you can make a large batch of the dough and freeze it for baking at a later time. Combine as listed and shape into 2″ balls 2″ apart on ungreased cookie sheets. Bake at 375 degrees F for 15 minutes. Transfer at once from baking sheets to paper toweling to cool. 1) Is FRUIT Making You Fat?